A few days ago the Boston Celtics released their schedule for the upcoming 2008-2009 NBA season. Today an e-mail arrived in my inbox from the C’s announcing the release of their half-season schedules. As a half-season ticket holder, I was obviously quite curious to see what games I’d be attending (especially since I thought I’d be going to the home opener). Well, here’s my half of the schedule, and yes I will be attending the home opener! Tuesday, October 28 – Cleveland Cavaliers – 8:00 p.m.
Friday, November 7 – Milwaukee Bucks – 7:30 p.m.
Wednesday, November 12 – Atlanta Hawks – 7:30 p.m.
Tuesday, November 18 – New York Knicks	7:30 p.m.
Wednesday, November 26 – Golden State Warriors – 7:30 p.m.
Wednesday, December 3 – Indiana Pacers – 7:30 p.m.
Friday, December 5 – Portland TrailBlazers – 8:00 p.m.
Friday, December 19 – Chicago Bulls – 7:30 p.m.
Tuesday, December 23 – Philadelphia 76ers – 7:30 p.m.
Friday, January 2 – Washington Wizards – 7:30 p.m.
Monday, January 12 – Toronto Raptors – 7:30 p.m.
Monday, January 19 – Phoenix Suns – 8:00 p.m.
Wednesday, January 28 – Sacramento Kings – 7:30 p.m.
Thursday, February 5 – Los Angeles Lakers – 8:00 p.m.
Sunday, March 1 – Detroit Pistons – 1:00 p.m.
Sunday, March 8 – Orlando Magic – 1:00 p.m.
Monday, March 23 – Los Angeles Clippers – 7:30 p.m.
Sunday, March 29 – Oklahoma City – 7:00 p.m.
Wednesday, April 1 – Charlotte Bobcats – 7:30 p.m.
Wednesday, April 8 – New Jersey Nets – 7:30 p.m.
Friday, April 10 – Miami Heat – 7:30 p.m. I didn’t get to see the Phoenix Suns last year so I’m also pumped to see them! 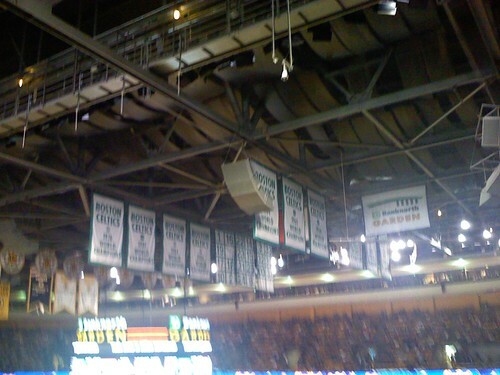 Most importantly though, it’ll be great to see the Boston celtics raise up another NBA Championship Banner on opening night. Very cool. I haven’t been to an NBA game in a long time. I think the last game I went to was the Bulls VS. Bucks and Jordan was still playing, haha. Justin Wrights last blog post..Blogging: Whatâ€™s In It For You? Exact opposite here Justin. I’d never been to an NBA game until last season! Hmm, coincidence or….